Air hockey used to be a two player game, but not any more! Thanks to the Ellipse 6 Player Air Hockey Table by American Heritage, the whole family can get involved. The Ellipse offers more pucks and more goals for more players which equals a whole lot more fun! This imaginative air hockey table offers a lighted scoring system, screen-printed galaxy design, and a powerful fun for smooth game play. The Ellipse 6 Player Air Hockey Table also has leg levelers, which are invaluable when floor surfaces can vary so much. It also has two Bluetooth speakers so you can soundtrack your game! 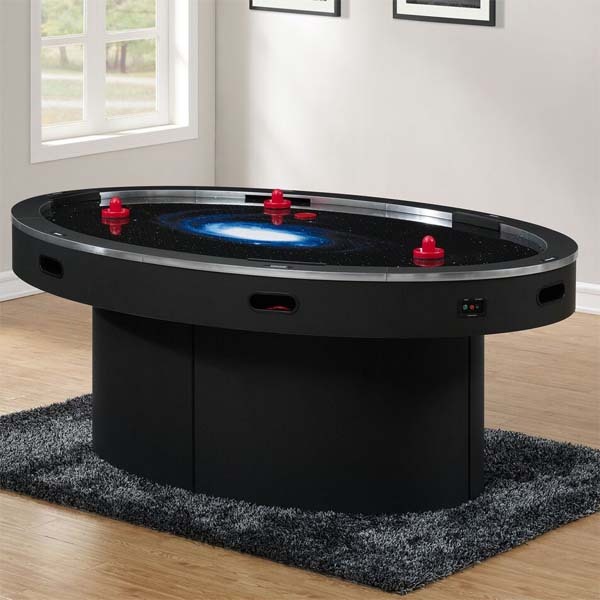 Get an active game everyone can play with the Ellipse 6 Player Air Hockey Table! This item requires freight delivery. This shipping method uses a full size semi - truck and product can be delivered to a streetside location or into a room of choice based on the level of service requested. Most delivery times within the Continental U.S. range from 5-7 days on in stock merchandise. A representative will call to schedule your delivery which will require a signature upon receipt.